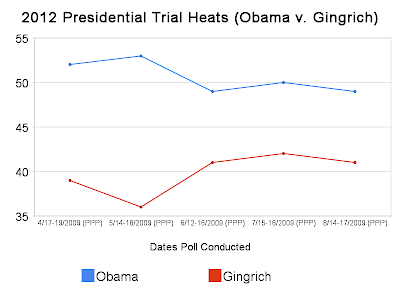 For Gingrich, this is the worst showing since the May Public Policy Polling survey (the one that had the most representative sample until the August poll). There really isn't that much to say about the former Speaker. He has been polled among the Big Four throughout 2009, but has yet to measure up to the Huckabee/Palin/Romney group either in the primaries or against the president. That certainly doesn't change here. Odd as it may seem, this is the continuing trend in this data as of now. Palin is doing worse among women than with men against Obama and has the highest gender gap (relative to the other Republican candidates). And that is striking. 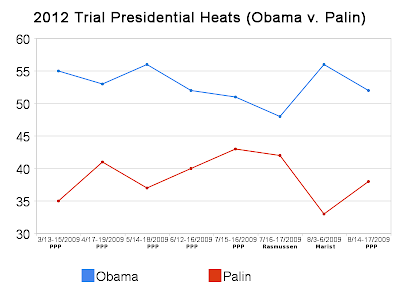 What's worse is that the overall gap between Palin and Obama is now wider than it was prior to her resignation. The three August polls conducted pitting the former Alaska governor against Obama, show the governor under 40% and the president above 50%. That wasn't the case after she announced her resignation, but actually having step down (at least at first glance) seems to be the line of demarcation between these poll trends. Meanwhile, Mitt Romney continues to place, if not the closest to Obama (Huckabee has been consistently closer in the PPP polls. ), then second closest. And the former Massachusetts governor has been among (along with Huckabee) the candidates who have been able to minimize the amount of support the president garners in these polls. 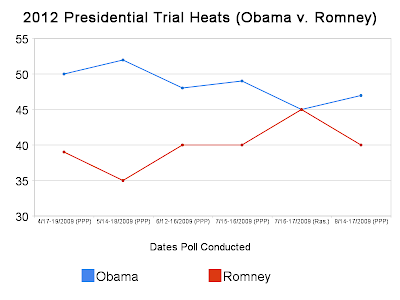 The biggest pro and con in all of this 2012 trial heat polling is that one firm (Public Policy Polling) has been doing most of the work. That is good for the sake of comparison across polls, but by the same token is subjecting us to the same house effect over and over again. In other words, we're just missing out on the view from other polling outfits. That's why the Obama/Romney tie in the July Rasmussen poll was so surprising; it followed up the PPP polls that showed Romney close, but struggling to break the 40% barrier. Again, the one thing Romney could hang his hat on there, was that he was keeping the president under 50% in many of those polls. And honestly, that's not a very strong hook and the hat is somewhat heavy. I still have to caution that this is all extremely early in the 2012 cycle. But the trend among women with Sarah Palin included continues to be a noteworthy statistic across all of these polls. *Please note that the full national sample size was used in the write up of the Republican primary poll last night. That has been corrected. The Republican portion of the sample was comprised of 353 respondents. **This figure is calculated as the sum of the deficits among women and men for each candidate against President Obama. For example, in a hypothetical match up between Obama and Minnesota governor Tim Pawlenty, if the president had a 53-37 advantage among women (-16 for Pawlenty), but the governor had a slight advantage among men, say, 44-42 (+2 for Pawlenty), the gap would be -14 (-16+2). Have the Races Changed in New Jersey and Virginia? As we get ready to usher in the fall campaign once Labor Day passes next week, both gubernatorial races this year are at something of a crossroads. In both cases, the Democrat is trailing and in both cases, the Republican has been faced with some negative news recently. In New Jersey, Chris Christie is weathering the storm of links to the Bush administration as well as a series of personal issues. [Well, that makes it sound like a drug problem or something of that ilk. Speeding tickets and loans to subordinates aren't drug problems, but they don't come free of any negatives.] Further south, in Virginia, Republican Bob McDonnell is being haunted by his own words from twenty years ago, in the form of a Regent University master's thesis. My first reaction to the McDonnell news was that if Democrats wanted to use the thesis effectively, they would have to be selective with it and not bombard people on the chance that it could trigger a backlash. After all, the Virginia electorate that has been picked up in polls since the June primary has tilted to the Republican end of the spectrum. This news isn't necessarily going to change their minds; it might energize them further. The power of this story, though, is in its narrative capacity. Democrats and the Deeds campaign have been pushing the "this isn't the real McDonnell" card since the spring, but they now have something to hang that on and refer back to ad infinitum. Anytime McDonnell says something that in anyway links back to the thesis, Democrats will pull it into the "that's all part of his blueprint" narrative. And while there is the chance that that also risks a backlash, it is a gamble that could also play well with apathetic Democrats and independents, who have to this point remained on the sidelines in this race*. But to say that that isn't a tightrope act for Democrats and Deeds is a mistake. The degree to which Deeds can find that balance between effectively playing this (and making trouble for McDonnell) or seeming desperate will determine the direction of this race down the home stretch. In New Jersey, the narrative has progressed to its second step (beyond the Bush connection). Instead of the debate being on moderate/not moderate turf, as in Virginia, this one seems to revolve around Christie's judgment (the bent of the news does lately, anyway). So, while Christie maintains a lead in the polls, you can certainly see that the stories have shifted in this race from "throw the bum out"/anti-incumbent stories to "does Christie have the requisite judgment to be governor?" stories. And that isn't a good change in the prevailing winds for the challenger. Does that mean trouble for the Republicans currently leading the polls in both states? Possibly, but it could end up costing the Democrats if their actions are perceived as desperate. The latter is more likely in Virginia simply because of the underlying partisan composition of New Jersey. Corzine just simply has a cushion (even while trailing) that Deeds does not in Virginia. 1) Timing. Is this too early for a closing narrative to emerge? If either becomes established, will it be stale by time the waning days of October roll around? The press may be looking for something new by then. 2) Decision-making: I need to check on this in the gubernatorial context, but it is true that in presidential races, most likely voters have made up their minds by around Labor Day. James Campbell would also contend (and has shown) that the polling around that time of the race is also the best indicator of the November election results. I'll have to check on both, but I thought I'd throw both ideas out there. Obviously the presidential race is a bit more high-profile, which hypothetically would mean that voters may wait a little longer in a gubernatorial race. In any event, these items merit tracking over the next few weeks. *The Public Policy Polling survey due out of Virginia purportedly shows heightened interest from Democrats versus a month ago (and this poll was in the field before the thesis news broke for the most part). However, McDonnell still has a 2:1 advantage among independents (again, pre-thesis). This is the first evidence anywhere that any of the troika of Huckabee, Palin and Romney are breaking away from one another. Romney has an eight point edge in this poll, the largest margin anyone of the trio has held over anyone else in the group in all of 2009. And this is the first time anyone has eclipsed the 30% mark in any of the polls conducted thus far. That mark is also the highest any prospective 2012 GOP candidate has been since Sarah Palin was at 29% in the February CNN poll. Yes, these are nice factoids, but no, they don't mean that much in 2009. However, as I said, this is the first instance in which there has been any significant light between any of the Huckabee/Palin/Romney group. If one thing has been true in these polls throughout 2009 it is that in any given poll at least two of these candidate are within the margin of error of each other. That isn't the case here. Also notable is the fact that Jindal made it onto the list of candidates. There isn't anything right or wrong about that, but it is strange to see Jindal included, but someone like Pawlenty left off. I hate that Clarus didn't shed any light on who the candidates were that were among the 2% volunteered group. [I'm willing to bet Mark Sanford wasn't named.] As I've said previously, though, beggars can't be choosers in these situations. Three years out, you can take what you're likely to get. One theme that FHQ will touch on tomorrow is how Palin is doing among women; not that well. We have observed that phenomenon in the context of the head-to-heads with Obama but not in a primary setting. Surprisingly, Huckabee actually does better amongst women than men; the former Arkansas governor is +11 in the female to male comparison. Every other Republican candidate falls well behind that mark, however; all the way into the negatives. Romney has the largest deficit (-7), while Gingrich, Jindal and Palin all have -3 deficits of women to men. That certainly is more in line with where Republican candidates end up in these comparisons versus Democrats, but that Huckabee number is noteworthy. 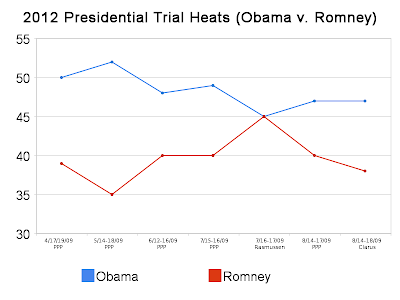 Tomorrow FHQ will have a glance at how those gender breakdowns look in the trial heats against Obama. No, not presidential primaries (...at least not directly). Yesterday the New York Times ran an article about the trouble an amendment buried in this year's defense authorization bill is causing on the state level in New York. Now, this isn't unusual. National legislation, due to our federalist system, often has ramifications on the state and local level. However, this is a defense bill. Yes, that can affect funding for bases and through other means in the states, but this is about elections, specifically primary elections. Where's the connection? Actually, New York senator, Chuck Schumer, added the amendment that could affect his home state and any other state with a primary election within 45 days of the general election. * The whole point of the amendment is to give military personnel outside of the country ample opportunity to vote, but it could end up causing some headaches for state legislatures and secretaries of state/boards of election in many September primary states. Well, what's the big deal? Move the primaries to earlier dates, get the ballots printed and mailed out and be done with it, right? Ideally yes, but this is politics. It's never that easy. A small move back into, say, August would mean that the elections would fall at a time when people are trying to fit vacations in before the schools start or just because the summer is coming to a close. That is the argument the Douglas Kellner, the co-chair of the New York State Board of Elections is making anyway. Honestly though, that is pretty weak. If August is so bad, then why are fourteen states holding their primaries or runoffs during the month (see above list link)? I understand the normative issues behind making it appear as if you are doing things that are supporting higher voter turnout, but even this Times article started off with the line, "It is hard enough to get New York voters to the polls for any September primary." As such, the Board of Elections just appears as if it is stalling. But let's continue with that charade for a moment. Let's assume that vacationing and the "pressure put on the county boards of election" together are a big enough deal to eliminate August as an option in New York (and maybe even some other September states). What then? What are the options? The Times suggested a return to the June date the state's primary was held on until 1974. What are the pros and cons around a move to June? The issue then is that such a large move potentially affects the calculus in the state legislature, where this change would have to be initiated and pushed through. Why? Well, the folks in the New York legislature all face primary elections every two years as well. The move could affect their fortunes. Antsy elections officials and antsy legislators. That isn't a recipe for change. Of course, neither is the fact that New York's state assembly has been a touch dysfunctional this session. Another issue with a move to June is that the economy now comes into the picture. Matt from DemConWatch and I were discussing this in an email exchange earlier, and he speculated that this [a move to June] could put pressure on some of the September primary states to hold their presidential primaries and state and local primaries on the same date. And it could from an economic standpoint. The whole reason some of the May and June presidential primary states have not frontloaded is because they hold all their primary contests at one time. That gives states with late primaries for state and local offices a huge advantage. Their primaries for those offices were after the end of the presidential primary window earlier on in the post-reform era, so they had to have separate contests. They were forced to fund that extra election (presidential primary) or move the other election up (and we see what a potential issue that can be). In the period between 1976 and 1996, in fact, I've found that those September primary (for state and local offices) states are seven times more likely to frontload their presidential primaries than those states where all the primaries are held concurrently. Once the election cycles through 2008 are included the effect decreases; those split primary states are only twice as likely to frontload once the hyper-frontloaded elections since 1996 are accounted for. What does that have to do with the economy? Well, if the economy is still in poor shape heading into next year, then there may be some in these late primary states who call for the presidential primary and primaries for state and local offices to be held together as a cost-saving measure. "We're already talking about moving the other primaries, why not discuss the presidential one too?" But I just don't see that happening. With the exception of maybe Rhode Island and Vermont, I just don't see any motivation for those states to move their presidential primaries back to June. Rhode Island couldn't make February 5 work prior to 2008 and used to have a late presidential primary (prior to 1984) and Vermont held beauty contests and caucuses until 1992. Those two may be motivated to move, but few others are going to give up their early status unless forced to do so. And if both parties institute a "nothing before March except Iowa and New Hampshire (and maybe Nevada and South Carolina)" policy ahead of 2012, some of these states may be forced to reconsider their positions in the presidential primary calendar. But with decisions on the rules for 2012 coming after the point at which a state legislative decision to come into compliance with this bill (should it become law), I just don't see it happening. As always, though, it will be fun to track. *Well, that isn't entirely true. That's the way it reads in the Times article, though. The truth of the matter is that New York's September 14, 2010 primary election is outside that 45 day barrier in the provision. However, the issue isn't necessarily the timing as much as it is holding the primary so that the general election ballots can be printed and mailed off to those in the Armed Services prior to the 45 day barrier. The New York primary is seven weeks before the November 2 election and four days likely wouldn't be enough time to get those tasks done. Hat tip to Matt at DemConWatch for the link to the New York Times piece. I don't know how I missed this on Thursday (I suppose there are only so many times you can search "Democratic Change Commission" in Google News. At least the news broke after I wrote that all was quiet. ), but in the wake of the Kennedy death and funeral, the DNC postponed the Change Commission's meeting "until further notice." Here comes word of the latest cancellation out of respect for the passing of Senator Edward M. Kennedy. A Democratic Party panel that is taking another look at the presidential nominating process -- likely including the timing of the early contests in Iowa and New Hampshire -- was scheduled to meet Saturday in St. Louis. That will be the day of Kennedy's funeral in Boston, expected to draw many Democratic leaders. The Democratic National Committee said the meeting of the Democratic Change Commission has been postponed until further notice. The panel, created last year, is to address "1) changing the window of time during which primaries and caucuses may be held 2) reducing the number of superdelegates and 3) improving the caucus system." The commission must issue its report and recommendations to the DNC Rules and Bylaws Committee no later than Jan. 1. There's really nothing new in there other than the delay of the meeting (That January 1, 2010 deadline looms, too though, I suppose). And with the third meeting scheduled for October 24, the panel has a bit of time during September for another meeting. But I wouldn't be surprised if they rolled the second and third meetings into one in October. And I'm going to throw this out there too: It would be nice if they would hold this meeting in the home state of the other commission co-chair, Jim Clyburn (This second meeting was in co-chair Claire McCaskill's home in the Show-Me state.). And yes, I say that for completely selfish reasons. It is far easier to go from North Carolina to South Carolina than it is to go from the Tarheel state to DC or Missouri. ...and this is something that the Democratic Change Commission will want to consider if the primary/caucus system in Texas comes up in the discussion at its meeting tomorrow in St. Louis. It is even more interesting because this is bound to come up in the session. "Under Section 5, any change with respect to voting in a covered jurisdiction -- or any political subunit within it -- cannot legally be enforced unless and until the jurisdiction first obtains the requisite determination by the United States District Court for the District of Columbia or makes a submission to the Attorney General. This requires proof that the proposed voting change does not deny or abridge the right to vote on account of race, color, or membership in a language minority group. If the jurisdiction is unable to prove the absence of such discrimination, the District Court denies the requested judgment, or in the case of administrative submissions, the Attorney General objects to the change, and it remains legally unenforceable." Most of the jurisdictions covered are in the states of the former Confederacy and as the map below (also from DOJ) indicates, Texas is on the list. The catch is that Section 5 typically applies to election procedures for general elections and primaries for state and local offices, not to presidential nomination races. It is a logical extension though. As I mentioned the other day, delegate selection plans are submitted by each state to the (national) Democratic Party for approval, but these have not been the subject of a Section 5 preclearance review in the past. Though, it may be a logical extension of the law, it has, to this point at least, been assumed that the national parties held the right to make the determination of what was admissible in terms of presidential delegate selection on a state by state basis. And the Democratic Party has been approving the Texas Two-Step for years. This isn't a new conflict. In 1988, for instance, Michael Dukakis won the Texas primary and Jesse Jackson won the caucus (There's more about that here. ), only there wasn't nearly as much resulting tension as there was between the two main candidates in 2008. Also lacking in 1988 was the fact that less inclusive segment of the plan (the caucus) overturned the results from the more inclusive other segment (the primary). But the thing about the American legal system is that it is not proactive. The legality of something has to be challenged for it to even make its way into the judicial system to be questioned. However, it isn't really the Texas Two-Step that is being questioned here, but the delegate equation behind it. Specifically, that past voting for the Democratic Party candidate in a statewide campaign in jurisdictions would determine the strength of that jurisdiction in terms of delegates. That's nothing new. In fact, past voting history and population are used by the national party to determine how many delegates each state gets. And the states, in turn use a similar formula to allocate them on their level. However, the plaintiffs in the Texas case are arguing that the support of 2006 Texas Democratic gubernatorial candidate, Chris Bell, had the effect of undervaluing Latino voters in state Senatorial districts (the jurisdictions in question. Texas used Senatorial districts whereas most of states divvy up delegates across US House districts.). The problem was that the Texas Democratic Party's formula used raw vote totals instead of the percentage of the vote in Senatorial districts. In essence, even though majority white districts provided Bell with more total votes than some majority Latino districts, they were allocated more delegates despite the fact that the percentage of support for Bell in Latinos districts was higher. When population of the district was accounted for, then, those districts were diminished in value. So while I'm tempted to use the court's words* against it (This is a minute detail. ), it is a fairly consequential statistical blunder in my view whether it was intentional or not. The type of snafu that will get you taken to court. This is very interesting stuff and something that the Democrats at the Change Commission meeting tomorrow would be well-advised to consider if the Texas Two-Step comes up (or even if it doesn't). A tip of the cap to Ballot Access News for the link. The Democratic Change Commission kicks off its second meeting tomorrow morning at 9:30am in St. Louis. A quick glance at C-SPAN's schedules for tomorrow shows that the network and all its various channels will be focused on the Kennedy funeral* instead (That's probably as it should be. ), which means that interested parties will be without live (or even taped) coverage of the event. Considering that the event is billed as being open to public comment, that's too bad. But under the circumstances, it is understandable. I'll add others when and if I come across them. And if there's any interest, I'll open up a thread for comment-in-real-time in the morning. Just let me know in the comments section if you're interested. *Speaking of the Kennedy funeral, I wonder what effect that event will have on attendance at tomorrow's meeting. It seems like several members of the 37 member group examining the reform of the presidential nomination process would be inclined to attend. Chairs Claire McCaskill and Jim Clyburn would be particularly conflicted to some degree I'd imagine, having served on the Hill with Kennedy (Rep. Clyburn, from his position in the House, didn't serve directly with Kennedy, but Sen. McCaskill did.). I suppose they could appear "via satellite" from Boston/Washington if they had to. And if you look at our previous averages for this race, this particular poll nicely echoes the status quo. From that view, that's good news for Chris Christie. 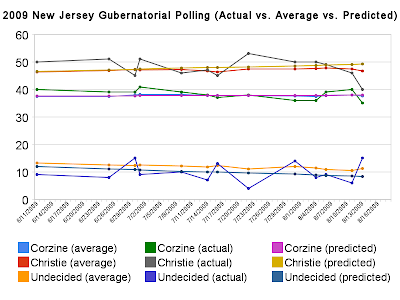 Of course, since the last Rasmussen poll, Corzine has held steady while Christie has dropped four points from 50% to 46%. And when the leaners are included in the totals the margin shrinks to just eight points, 50%-42%. That would appear to be good news for Corzine. And the picture is even rosier when the earlier August leaners results are compared. On August 4, Christie's lead was 13 points, 52%-39%. Update: Of course, none of that was as good as the GQR/Democracy Corps poll that came out later in the day. Both candidates gained since the firm's poll two weeks ago, but Jon Corzine gained more, jumping six points from 35% to 41%. Meanwhile Chris Christie had half as large a jump, moving from 40% to 43%. [Though, if you look at the toplines in the link provide above, you'll see that Christie's numbers, when broken down between Christie supporters and those leaning toward the Republican, sum to 44, not 43. It is a minor quibble, I suppose, but considering the graduated weighted average has been stubborn in this race, the half point difference between running it with the 43 versus the 44 is something to take note of.] However, the net effect on the weighted average was minimal. Once the full weight was removed from the Rasmussen poll and put on the Democracy Corps poll (It was the poll most recently in the field. ), the race remained stuck on 46-37 in favor of Christie. In the comments to Democratic Change Commission post I put up yesterday, Rob pointed out something about the late Ted Kennedy's endorsement of Barack Obama's presidential candidacy last year that was running through my mind yesterday. "I know that I am slightly off topic here, but one of the tributes to Ted Kennedy is that his endorsement of the Obama candidacy was a key factor in Obama's nomination. As I recall, many commentators at the time suggested that the endorsement was a big blow to the Clinton campaign. I thought, though, in the aftermath it became a consensus opinion that none of the endorsements in that campaign meant much, even EMKs. Am I imagining something or is this point just part of the glow of appreciation of man who has just passed away?" The underlying question is, "Did Kennedy's endorsement have an impact and if so, to what degree?" There's no doubt that it had an impact. But measuring the endorsement's influence is difficult. For starters, we know that the endorsements game is one of zero sums. If Barack Obama gets the endorsement, then Hillary Clinton cannot. [Well, I suppose flip-flopping superdelegates are an exception to that rule. John Lewis, I'm looking in your direction.] Beyond that, we also know that in a presidential primary election environment, where contests follow one another (or groups of contests follow other groups of contests), the easiest way to measure the impact is to see how elections results are affected following the endorsement. Now from a hypothetical standpoint, this impact would be the greatest within the political boundaries and among the constituency the endorser represents. January 27: Caroline Kennedy's op-ed endorsing Obama appears in the New York Times. January 28: Ted Kennedy endorses Obama. February 5: Clinton bests Obama in the Bay state by a count of 56% to 41%. The immediate, back of the napkin reaction in our (UGA) discussion group, as I recall, was that the endorsement didn't seem to have had that much of an effect. Some of the reasons cited were that the endorsement was made too close to the actual voting in the contest (just a week prior), and that Massachusetts was one among MANY other states holding contests on February 5. Indeed, to that second point, the Obama campaign was focused on grassroots efforts particularly in the caucus states on February 5 and beyond. That excluded Massachusetts. But that brings up an important distinction: short-term versus long-term influence of endorsements. Prior to and after February 5, it was becoming apparent that the Democratic nomination race would be one focused on the delegate count. That differed from past years where momentum quickly carried most eventual nominees to their party's nomination and delegate counts were an afterthought. But in 2008, everyone was focused on that counting to the detriment of everything else. Unlike other years, then, when a Kennedy-type endorsement, if it even came before the nomination was wrapped up, would have been rolled into the narrative of "Candidate X had the momentum and won the nomination," 2008 gave us a different angle. The race as it played out afforded us the opportunity to attempt to separate the long-term and short-term goals instead of having them overlap almost completely. Again, in the immediate aftermath of Super Tuesday, the Kennedy endorsement seemed to have backfired. But as Obama ran up the score throughout his February streak of victories and finally won the nomination in the late spring, the Kennedy decision looked better and better. If we step back and look long-term, the impact of the endorsement seems to have been that it helped Obama gain a foothold within the Washington establishment; a wing of the party that more often than not leaned toward Clinton. In that zero sum environment, then, Kennedy's endorsement did hurt Clinton's campaign, but only because it helped Obama's instead. But there's a spectrum there, right? Did it help Obama more or less than it hurt Clinton? Personally, I think it helped Obama more. Clinton was already doing pretty well among the Washington establishment. If you look at some of the posts over at DemConWatch just before Super Tuesday, you get sense of this. Upon Edwards dropping out just after the Florida primary on January 29, Clinton had a two to one (approximately) advantage in superdelegates over, but as Matt (DemConWatch contributor) pointed on the final day of the month, an interesting pattern was emerging among superdelegates. Obama was picking up momentum among the supers just before February 5; especially big name supers. The then-Illinois senator was outpacing Clinton and in fact gaining on her in that count. Kennedy's endorsement was just a part of that gradual movement toward Obama and maybe even slightly ahead of the curve. Note: I should mention that the view from the political science literature on the impact of endorsements is mixed. In many ways it is lacking mainly because of the issues I cited above. What is being influenced, in other words? Electoral outcomes are one possibility as are polling numbers in specific states whether measuring vote intention of overall approval. The problem with those measures is that there are obviously many other factors affecting their variation. Does that mean we pack it up and head home? No, but what that ultimately means is that we end up with mixed results ranging from an endorsement had no impact to an endorsement had a big impact. Understandably Ted Kennedy's passing has Democrats thinking about other things today, but even before that, there was and continues to be an almost total absence of the Democratic Change Commission in the news this week ahead of the group's weekend meeting in St. Louis. Normally, I wouldn't make that big a deal of this, especially considering that real news of the DCC's first meeting didn't start filtering out until the Wednesday before. Even then, that scant news was able to cut through a week that involved Mark Sanford's adultery admission new conference and Michael Jackson's death. [What a week!] To me, though, this is troubling because this is the meeting that is supposed to be open for public comment. Yet, we've heard nothing from the party since the August 7 press release announced the online suggestions form. There are however a couple of suggestions that are floating around out there that may see the light of day this weekend in Missouri. 1) End the Texas Two Step: Caucuses are definitely on the Commission's to-do list, but this is a tricky one. The problem some see in the primary-caucus set up in the Lone Star state is that primary voters' votes are discounted because not all primary voters return for the night cap caucus. That's all well and good, but this is still an issue that pits the national party against the state party; specifically a longstanding state party preference. And yes, the Democrats are more willing to strike down these types of structural anomalies than to yield to the states as the Republican Party typically does. There's also the issue of Obama's preference. The system in Texas did allow him to best Hillary Clinton in the Texas delegate count once the caucus portion was tabulated in June. This still seems like a Clinton/Obama holdover to me; one that will be left to Texas Democrats to decide. And yes, the Texas Democratic Party has already been looking into the issue. I should also note that each state has to submit a delegate selection plan to the Democratic Party for approval (or will in 2011). The party does have the power to strike that down if they wish. But Texas can pull a Florida/Michigan move and hold a primary-caucus anyway. Both Florida and Michigan submitted plans that called for their 2008 primaries to be during the party-sanctioned period; not outside the window where they were ultimately held. 2) Be more youth friendly: The DNC Youth Council also penned a letter to the DCC and asked that the group attempt to insure that contests don't occur too early. The argument there is that contests like Iowa's January 3 caucuses occurred at a time when students were still at home on winter break. That is a legitimate concern, but seems to be moot given that the DCC seems committed to pulling back the opening of the window in which contests can take place into March again. The Youth Council's other issue is with Saturday caucuses. Again, the concern is that weekend working youth would be disadvantaged. Some in the Jewish community may be willing to go along with the Youth Council on this one. Of course, now I really want to go and check out both the youth and Jewish proportion of the population in Saturday caucus states. In 2008 that list included Nebraska, Nevada, Washington and Wyoming. [Louisiana and South Carolina held Saturday primaries and Maine Democrats had a Sunday caucus.] This one will be talked about, because the effects aren't understood very well. There are pros and cons to having and not having weekend contests. There is a new poll out in the gubernatorial race in New Jersey, which at first glance looks like good news for Jon Corzine. Taken in conjunction with the poll out last week from Democracy Corps/Global Research Group, the new Neighborhood Research poll makes it seem as if Chris Christie's campaign is wilting in the late summer sun. Let's compare the numbers. It does, but those Neighborhood numbers are among likely voters. The 319 likely voter sample is pared down even further to include undefined "definite" voters . 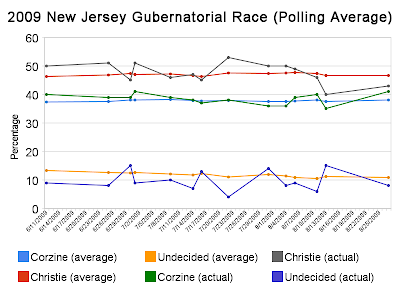 [Christie led among that group 39-36 over Corzine with Chris Daggett pulling in 6%.] I don't know what a definite voter is, but I do know that 319 is definitely pushing the lower end of the acceptable bounds for a statewide sample and that anything lower than that is questionable from a representativeness standpoint. Add to that the fact that Neighborhood Research is run by conservative strategist and former-Lonegan campaign manager, Rick Shaftan and the intrigue rises. Now, Steve Lonegan was Chris Christie's main opponent in the Republican gubernatorial primary earlier this year. Look, I'm not saying this poll is anything but legitimate, but that is two strikes against it; one on statistical grounds and the other falls in the "guilt by association" category. And I don't think either one is helping the other. So, please excuse FHQ if we're a touch hesitant about including this poll in our average for the New Jersey gubernatorial race. Late last week I was contacted by Stephanie Simon at the Wall Street Journal inquiring about the 2010 census and its implications. [And I didn't make the cut in her article today. Ouch! Ha!] Ms. Simon had run across FHQ's projected 2012 electoral college map and that served as her jumping off point, but as I was preparing some notes for our call, it occurred to me that the map and its projection create an incomplete picture of the process. Sure, we end up with the final product (the number of electoral votes (congressional seats) a projected number of states will gain or lose), but all the while, we are deprived of the background process. For instance, it is fine to speculate that Texas will gain up to four congressional seats/electoral votes. What, though, will the powers that be in the Lone Star state do with those new seats? That's the piece that's missing. Well, I suppose it isn't so much about what will be done in the gaining and losing states as much as it is about the likelihood of certain changes on the state level. That's what I want to look at a little more today. What outcomes are we likely to see on the state level and what factors affect those outcomes in the first place? The bottom line is that this whole process isn't necessarily as simple as saying, "Texas is a red state, so Texas will see significant Republican gains in Congress and in the electoral college." Well, Texas may not be the best example. First, let me note that I'll be focused here on the states projected to gain or lose congressional seats/electoral votes. Technically, all states have the option of redrawing their lines,* win, lose or draw, but I want to look specifically at those states that are forced to redraw their congressional district lines. Now, let's tackle the redistricting process. No, I'm not going to get into the laws in each state other than to draw a distinction between those states where congressional redistricting takes place in the state legislature and those where the process it filtered through an independent commission. Of those in the latter category, only two are projected to gain (Arizona) or lose (New Jersey) seats. From the latest projection via the Census Bureau (minus Arizona and New Jersey), then, we are left with six states likely to gain and ten states likely to lose seats following next year's canvass. Let's look at the situation on the ground in those states, how that may or may not change in the 2010 elections, and what implications that might have for how news lines in those states are drawn. What we see in the table above is the extent to which there is divided government (both interchamber and interbranch) across the sixteen states most likely to gain or lose seats. And though it is something of a minor point, given the general lack of partisan division throughout the majority of these states (especially the gaining states), we also see what offices are up for grabs in the 2010 midterm elections. For example, all six states projected to gain seats will have gubernatorial elections in 2010, but five of those six have only state House elections and not the entire legislature facing reelection next year. On the flip side, among states most likely to lose seats in Congress, eight of the ten have 2010 gubernatorial elections while half will see the entire legislature up for reelection (with the other half having only state House elections). Well, what does any of this mean? For starters, it makes the claim that red states are gaining seats and blue states are losing them more then simply facially valid. That is true. But in these cases, the underlying political make up on the state level backs that up as well. Of the gaining states, all but Nevada have unified Republican control. The result? Well, I suspect those state governments are going to draw those new districts in a way that is going to maximize the number of Republican seats in the state's congressional delegation. But that's just a hunch. The story is different in the states where population has increased the least (or decreased) over the course of the last decade. In only four states (and New York depending on how the Senate situation in the Empire state is progressing), is there unified Democratic government. With only two exceptions (Louisiana and Missouri), all of these states have Democratic governors, but there are varying levels of division between the executive and legislative branches or within the legislature. The net effect across both types of states is that the gaining states will have a relatively easier time coming up with redistricting plans that are beneficial to the clear majority party in the states (the Republicans). In the losing states, however, there will be more of a discussion (if not all-out, partisan fight) over to how to go about drawing the new districts. After all, some current member of Congress is going to get squeezed out. Who that is, or more importantly what party they are from, will be the result of that "discussion." *If we really want to get technical, all/most states have the option of redrawing their districts whenever they want, whether immediately after the decennial census or not. It wasn't until the 20th century that midstream redistricting (those like Texas' 2003 redistricting plan after Republicans won full control of the state legislature) began to be frowned upon, or at least went out of vogue. It was quite common in the 19th century to see state legislative control change hands and quickly be followed by the implementation of a complete redistricting. For more on this see Carson, et al. (2006). Edit: Please note that the table heading has been changed to accurately reflect the data contained therein. You have to love taking shortcuts that involve reusing the template from a previous table only to find yourself forgetting to change the original heading. I apologize for any confusion. Part of the reason FHQ wanted to examine the New Jersey and Virginia gubernatorial races this year was not the races themselves as much as what they represent: an opportunity to test and try out a few things in terms of how we process new polling information as it comes in. To this point, though, we have essentially leaned on the graduated weighted averaging formula used to a fair amount of success in the presidential race last year. There's nothing wrong with that formula. It was far more simplistic than some of the alternatives out there and only missed North Carolina and Indiana in the electoral college categorization (Even then, North Carolina was essentially a tie in the average. But I digress...). The governors races in New Jersey and Virginia, then, are being utilized with an eye toward 2012 and the electoral college. First of all, one feature that would have been nice last year (for every state or at the very least the swing states) is a graph similar to the ones FHQ has appended to each New Jersey and Virginia polling update. As I said recently, though, the lines on those charts seem to be floating in space without some baseline for comparison (the actual raw polling data, for instance). But that got me to thinking: The graduated weighted average is constructed to give the most recent poll the most weight, but also to incorporate past polling data in a way that guards against a shock to the system; an anomaly. And all that really is is a poor man's regression line. My question then was, How does the graduated weighted average stack up against a simple regression projection based on the polling data we have at our disposal? Sure, I could take an "everything but the kitchen sink" approach and add seemingly relevant variables to my heart's delight, but let's see how a simple bivariate regression as a start. Remember, Virginia and New Jersey are test cases for the 2012 electoral college model. So all I did was regress the time in the campaign so far (measured as the number of days in the campaign*) on each candidate's share of support in the polls conducted over that period. All that basically does is provide us with a trendline based on the hypothesis that over time there will be some changes to a candidate's level of support. Yes, that is ambiguous, so let me be a bit more specific. Most clearly, we can hypothesize that over time, the undecided share will decrease and in this particular instance, that the Republican share will increase. Indeed, in both cases, the time component explained a surprising amount of the variation in the undecided share across polls as well as both Chris Christie's and Bob McDonnell's support (between 30 and 50%). But the two Democratic models performed far worse. In both cases, less than 10% of the changes in Deeds' and Corzine's shares were accounted for in the time series. Why? Well, in neither case is there much change to speak of. There's more change in the Deeds case than for Corzine, but not by much. Fine, what does any of this mean and what does it leave us with graphically? Good questions. I'll take the second one first and then use the two figures below to illustrate the former. Graphically, as you can see below it leaves us with a bit of a mess. Nine separate lines are a lot to take in. However, there is a wealth of information in these two figures. The most volatile lines are the raw polling datum (referred to there as actual) while the smoother two lines around with they hover (and are based upon) are the graduated weighted average (average) and the regression projection (predicted). The raw data are nice, but let's focus on the other two lines, as this post is supposed to be about comparing two different projections of the state of each of these races. In the New Jersey example, we see that the graduated weighted average and the regression line track each other almost exactly in the case of Jon Corzine. Again, there isn't too terribly much change, relatively speaking, in the Corzine numbers and that keeps the lines closer together. Where there is more volatility, there is more divergence between the two measures. This is most clear among the undecideds. The graduated weighted average projects the level of voters yet to be had by either campaign at a consistently higher level in New Jersey since June than does the regression measure of the same concept. The same sort of phenomenon can be seen in Chris Christie's numbers. However, in this case the graduated weighted average comes in below where the regression finds the Republican candidate's support across these polls. And on the whole, the difference between the two measures appears to be growing over time. If the regression prediction is the more reliable measure (and that is an arguable point given the simplicity of the model), then the graduated weighted average is losing predictive power over time in regards to Chris Christie's share of support in this race. That isn't really the best trajectory to be on if you are attempting to use polling information as a means of forecasting the results of an election. But New Jersey is just one case. How do things look further south in the Old Dominion? Things are a bit more muddled in the Virginia example and that is largely attributable to the differences across the two races. First of all, there are far fewer polls that have been conducted in the Virginia race. Still, given the window of time that is being considered in each race, each state is averaging a poll every seven or eight days. 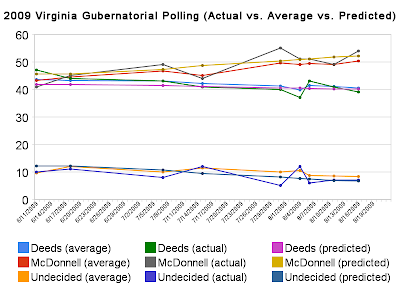 Regardless, fewer polls overall in the Virginia case translates to more volatility in the graduated weighted average. But also, there have been different dynamics at work in both races. In New Jersey, Jon Corzine has been stuck in a holding pattern in the polls while Chris Christie has, on the whole, gained over time. The Virginia case is quite different. The polls showed a close race early, but over time that has yielded a seemingly comfortable McDonnell lead. The smaller window of time in Virginia means that there is less time for past polling results to have decayed and less new polls to have outweighed them. As a consequence, the graduated weighted average is stuck to some degree; overvaluing some of those past results that were more Deeds-heavy. Well wait, what that really means is that this graduated weighted averaging methodology is bias against Republicans. It happens to be in this case. But what the average is really biased against is rapid change. And in 2009, both Republican candidates are the ones who are moving in the polls, at least as compared to their Democratic counterparts. Which brings us to the crux of the matter: The issue with the average has always been whether the past polls are over or undervalued. In this comparison, it seems as if those past polls are still being overvalued, potentially at the expense of gleaning the true state of each race. But let's return to those Virginia results for a moment. With the above caveats in mind, we would expect the average to underperform the regression in the McDonnell model while the two lines would remain rather close to each other (while slightly overperforming) for Deeds. All that means is that the status quo from poll to poll is protected more in the case of the average than with the progression of the regression trendline. What does this mean for the graduated weighted average? I'm not apt to scrap it just yet. This exercise is helpful in determining the usefulness of the measure in settings other than the electoral college (and even for the electoral college, truth be told). Again, FHQ even examining these races in the first place is a function of tweaking the measure with 2012 on the distant horizon. Better to do it while that is distant and not on top of us with or after the midterms next year. As for what this means for what you'll see in subsequent iterations of these polling updates, you'll continue to see the Actual vs. Average trend and will likely see occasional (and perhaps more advanced) regression model predictions. So, be on the lookout for that. *For New Jersey, that means the number of days since the first of the year (as Christie was the clear cut Republican frontrunner to challenge Corzine) and in Virginia, the time since the Washington Post's endorsement of Creigh Deeds in the Democratic primary race (It was at that point that Deeds was really first seen as a legitimate candidate in the race -- primary or general election.). Suggest early. Suggest often (...if you're so inclined). Here's the link. 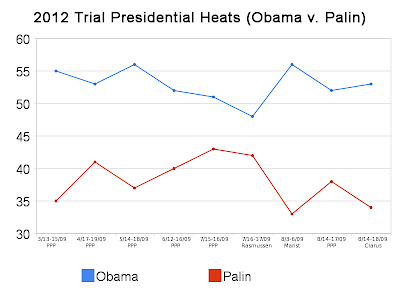 As I mentioned earlier, Public Policy Polling [pdf] released an August iteration of their 2012 presidential trial heats today. [Pop on over and check out the results in FHQ's first post, but in this space I want to get a better look under the hood.] Some still have issues with these polls, but as I've maintained, I like the information (even three years in advance), but don't operate under the illusion that these polls are not without their caveats. In addition, then, to the typical grains of salt these poll should be taken with there are other considerations as well. 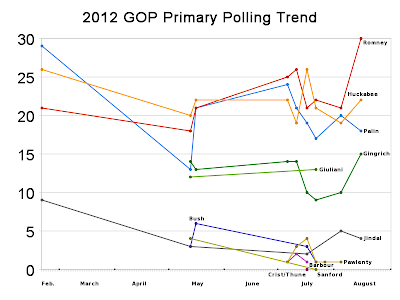 Last month it was the fact that Obama swept the South against all four prospective Republican candidates in the PPP poll. With the region question absent this month, the subject of my ire is the education question. Over one-third of the 909 respondents in the survey are identified as having some after-college graduate or professional training. That's a lot! It is however, interesting for a couple of reasons. First, in terms of the highest level of education achieved, the Census shows 28.7% of the US population as having a bachelor's degree or more (as of March 2007). Keep in mind, that that figure rolls in those who have a bachelor's degree and it still comes in below this PPP sample. Well, the Census figure is dealing with the total population and the PPP poll is looking at voters. Let's be fair. The 2008 presidential election exit polls indicate that 17% of voters had a least some amount of education beyond college. That's half of what PPP has represented in this sample. The second part of this is that of that 17% in the exit polls with some post-graduate education, 58% supported Obama. It is eye-opening, then that Obama seems to have a decreased level of support overall in this poll versus last month's results. Either Obama is slipping with this group (interesting in and of itself) or something is up with the internals of this poll. After all, if a third of the respondents are from a group the president won by a 3:2 ratio, then he should do better, not worse, in the poll overall. Of course, this education variable is new to the survey this month, so we don't have any means of comparison. It is something to keep in mind, though, as we look at the poll and the overall trends over time. Let's go through these alphabetically starting with Newt Gingrich. The former Speaker of the House has been in a holding pattern vis a vis the president throughout the summer. 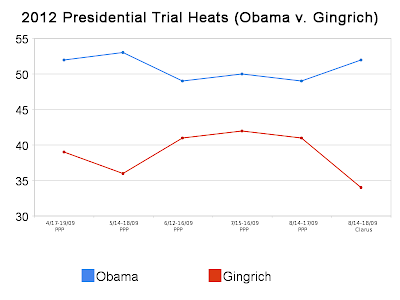 Along with Sarah Palin, Gingrich is the only other candidate with a negative approval differential. He and the former Alaska governor and vice presidential nominee both carry differentials of -9, though, more respondents are unsure on Gingrich than on Palin. 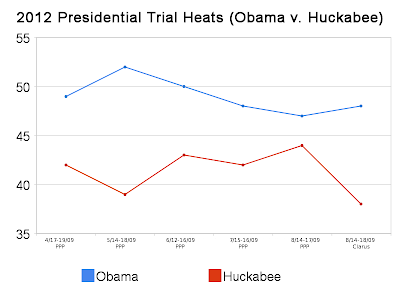 Though Huckabee's share increased in August over July, the trendline to track is Obama's. 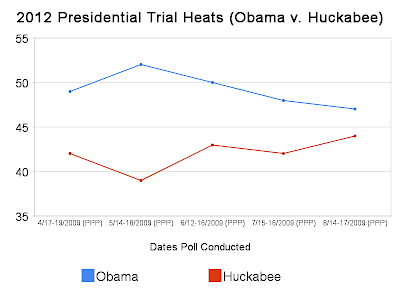 The president has steadily tracked downward against Huckabee in not only the PPP polls, but incorporating the other polls that have conducted trial heats on the 2012 race as well. The former Arkansas governor is the most favorable (+17) of the four prospective Republican candidates and does the best of all four among former McCain voters in the sample (84%, Gingrich: 80%, Palin: 77%, Romney: 79%). Huckabee's dilemma is that he has yet to translate that into any notable financial gains for his HuckPAC. He trails both Romney and Palin in that regard. That can certainly be made up, but folks aren't opening their checkbooks for him yet. That Huckabee is within three points is noteworthy; there's no doubt about that. As for Sarah Palin, the former McCain running mate slipped versus last month's PPP poll, but certainly fares better than in the Marist poll released earlier in the week. I want to focus on race with Palin. I've already noted the continued gender gap issue she has; lagging behind the other Republicans among women against Obama (Gingrich: -17*, Huckabee: -5*, Palin: -28*, Romney: -14*). This continues to be a curious phenomenon, but isn't anything we haven't seen in past polls. The main question facing the Republican Party after the 2008 election, though, was race-based: How could the party appeal to the growing (especially Hispanic) segment of the population? Sure, that's melted into the background to some extent since the Democrats in the capital are helping them out in regards to 2010 and 2012 via their avenues of policy pursuit (And yes, there are plenty of media and messaging effects rolled into that as well.). Long term, though, it is a concern for the GOP. Well, which of the four Republican candidates included in this August poll does the best with Hispanics or who puts the party in the best position to potentially woo those voters? It isn't Palin. In fact, the former Alaska governor is the least favorable candidate among Hispanics (50% unfavorable) and her 17 point deficit against Obama with Hispanics is at the bottom (though it isn't as troubling on the surface as her approval deficit among Hispanics compared to the other candidates). Huckabee leads the way among Hispanics and offer Republicans the best opportunity to at making inroads with the group. Mitt Romney continues to look good on paper as a 2012 candidate. Financially, his Free and Strong America PAC is doing well and he typically fares well in the 2012 primary polls. As Tom Jensen at PPP pointed out today, though, Romney's issue is that he is the least popular of the four Republicans (Only 52% of Republicans approve of Romney. Gingrich: 56%, Huckabee: 66%, Palin: 72%). Additionally that has been an increasing trend over the course of the last few polls. That isn't the greatest sign for the former Massachusetts governor, but this trend does not seem to have stretched into some of the other polls, especially the primary polls. It is something to keeps tabs on, however. * The equation is simple the male differential against Obama minus the female differential against the president. If Tim Pawlenty, for instance, was +5 among men against Obama and -12 among women, the Minnesota governor would have a -7 gender gap. Which Republican is the Biggest Threat in 2012?